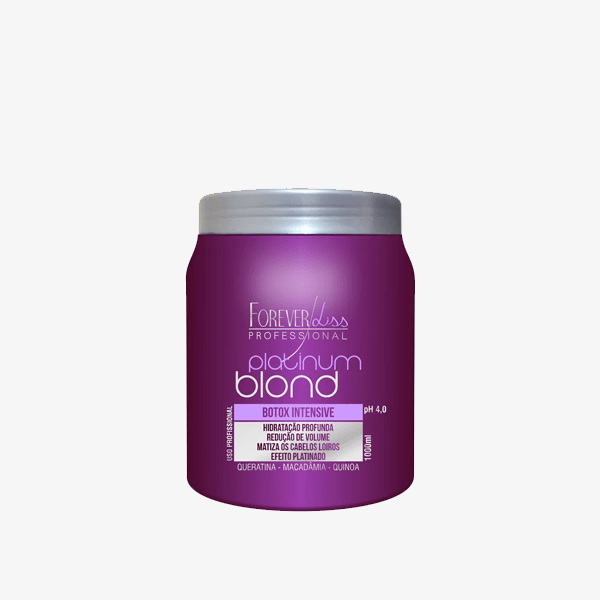 The Forever Liss Botox Platinum Blonde was developed with unique technology and special for blond hair, in order to moisturize, reduce volume and align the wires. The Forever Liss Botox Platinum Blonde Intensive Matizador was developed with unique technology and special for blond hair, in order to moisturize, reduce volume and align the wires. Promotes softness and tint wires eliminating the unwanted yellow tones, as well as platinum hairs and provide a perfect blonde. Nourishing and rich in moisturizing properties, the Forever Liss Botox Platinum Blonde Intensive Matizador seals the cuticles and restores the hair fiber with a firming effect leaving the blond alive and platinum. Phytopigments: Exclusive formulation with microparticles of pigments rich in Resveratrol, organic active extracted from the purple grape. Keratin: Protein consisting of 21 amino acids that promote strength, strength, and protection of the threads leaving them extremely soft and moisturized. Macadamia Oil: Rich in vitamins that repairs and strengthens hair damaged by chemical processes and day-day aggressions such as pollution and high temperatures and thermal tools.Quinoa: Promotes a protective film in the hair preventing dehydration, besides providing intense brightness and alignment in the wires. Wash your hair with an Anti-Waste Shampoo. Dry 80% of hair by removing all moisture from the hair. Divide the hair into 6 parts. Apply the Forever Liss Botox Intensive Platinum Blond starting at the root and with the aid of a brush and fine comb to spread the product well throughout the strands. Let the Botox Intensive Matizador act for 10 to 20 minutes. After the pause time, rinse slightly removing only the excess product. Dry and brush your hair. Then separate the wires into thin wicks and plank 7 to 10 times each wick. Finalize as you wish.